The party has long shrouded racism in the language of “self-determination”—now, they feel vindicated. On June 28, five days after Great Britain voted to leave the European Union, Marine Le Pen, the controversial leader of France’s right-wing National Front party, published an op-ed column in The New York Times congratulating British voters and celebrating the result. The day following the vote, she had visited the Elysée Palace, the residence of French President François Hollande, urging him to pursue a similar course. Needless to say, her efforts fell on deaf ears—but she wasn’t there to persuade Hollande. Le Pen cagily exalted the Brexit vote via recourse to a pseudo-democratic idiom of national self-determination, alleging that the outcome signified a triumph for free peoples everywhere. Yet, as anyone familiar with the National Front’s checkered history well knows, there is a cavernous gap between Le Pen’s high-sounding rhetoric and the sordid reality underlying the party’s political program. In this respect, Le Pen’s remarks exemplify a strategy that she has carefully honed ever since 2011, when she acceded to the party leadership: the effort to mask the party’s retrograde, ethnopopulist agenda by deceptively invoking a discourse of rights and civic freedom. The National Front was founded by Marine Le Pen’s father, Jean-Marie Le Pen, in 1972. Now 88, Jean-Marie began his political career in the 1950s as a member of a short-lived, right-wing populist party founded by Pierre Poujade. Prior to entering politics, the elder Le Pen served as a foot soldier in what was then French Indochina and then as a paratrooper during the sanguinary Algerian war (1954–62). In the past, he has justified—even flaunted—the French army’s use of torture against Algerian civilians. During the 1960s, a “record company” he founded—in truth, a front organization for the distribution of neofascist propaganda—was prosecuted and fined for disseminating Nazi ideology on liner notes. Over the years, the elder Le Pen gained notoriety as a result of a series of anti-Semitic assertions and outré pronouncements. He has gone on record saying that things weren’t so bad for France during the Nazi occupation (1940–44). On more than one occasion, he has claimed that, in the course of World War II, the Holocaust was a mere “detail.” In commenting on Jewish journalists or politicians, he has resorted to crude puns that allude to the Final Solution: “Durafour crématoire” to refer to then–Minister of Public Service Michel Durafour; for entertainer Patrick Bruel, Le Pen threatened to provide a “fournée” or “oven,” since in French “brûler” means “to burn.” Because various form of hate speech, including Holocaust denial, are criminal offenses in France, the elder Le Pen has been prosecuted and fined on at least 19 occasions. The “Bruel-fournéee” episode occurred in June 2014, just a few weeks following the National Front’s stunning breakthrough in the European parliamentary elections. In other words, just as it appeared that Marine Le Pen’s strategy of “normalization” had been successful, Jean-Marie’s gaffe threatened to relegate it once again to the political fringe. Marine Le Pen’s reaction was forceful and swift: She demonstratively instituted a party ban against her father. However, what seemed to trouble her was less the anti-Semitic tenor of the elder Le Pen’s remarks than that he had made them publicly. Thus in commenting on her father’s tasteless wordplay, Marine claimed that the problem lay chiefly with the “malevolent interpretation” to which they had been subjected by the French journalists, rather than his comments per se. Historically, the elder Le Pen’s publicity-mongering tactics were inordinately successful in garnering attention for the National Front cause. His efforts to position the National Front as a credible alternative to France’s main center-right and center-left parties, the RPR (Rassemblement pour la République; now, the Republicans) and the Socialists, crested in 2002 when, in an event that the French still regard as the political shock of a lifetime, the National Front succeeded in edging out Socialist Party candidate Lionel Jospin in the first round of that year’s presidential elections. However, two weeks later, the National Front was soundly defeated in the second round. It soon became clear that, under Jean-Marie’s leadership, the party had reached its zenith of popular support. Moreover, in the 2007 presidential elections, the party faltered badly: Its share of the electorate dwindled to 10 percent—a 7 percent diminution in comparison with its 2002 results—and it tumbled to fourth place among French political parties. From the moment she inherited her father’s mantle as party leader, Marine Le Pen’s main goal has been to endow the National Front with a veneer of political respectability in order to significantly expand the party’s electoral base—an objective that had proved next to impossible under Jean-Marie’s erratic stewardship. In this respect, she has been wildly successful, and the National Front’s political fortunes have escalated correspondingly. Estimates suggest that under her leadership party membership has doubled, from 40,000 to 80,000 members. 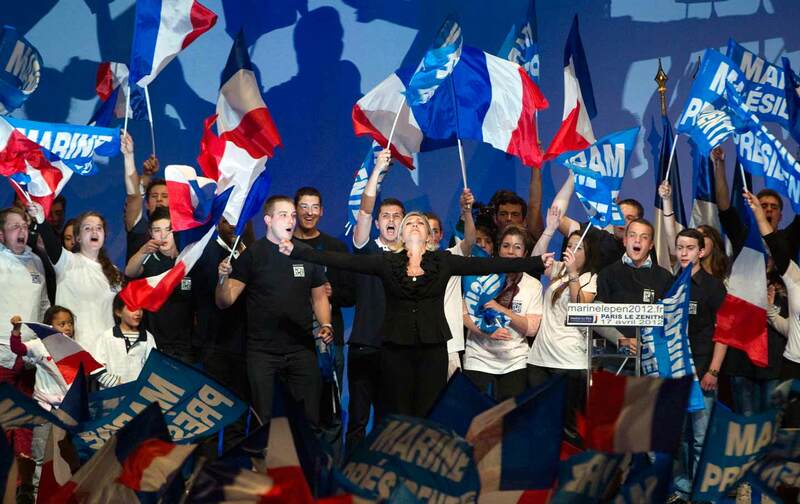 The watershed moment in the National Front’s political fortunes arrived with the May 2014 elections to the European Parliament. The National Front readily outshone the competition—Hollande’s Socialists and Nicolas Sarkozy’s UMP (Union pour un mouvement populaire). With 25 percent of the vote, it succeeded in becoming France’s leading political vote getter. Then, in December 2015, capitalizing on the rising tide of Islamophobia that followed the devastating November 13 Paris attacks, the National Front’s share of the electorate soared to 28 percent in the first round of regional elections, though National Front candidates were denied the major political breakthrough that many political experts had forecast. Nevertheless, in the lead-up to next year’s presidential elections, and with France’s mainstream political parties in a state of considerable disarray—at 12 percent, President François Hollande’s approval rating is the lowest of any postwar French head of state—there are few grounds to dispute the widely shared, disturbing prognosis that France’s political future belongs to the National Front. According to the paradigm of differentialist racism—whose political efficacy should not be underestimated in light of the omnipresent threat that far-right parties pose to European political stability—it is the representatives of France’s republican status quo who foment intolerance, insofar as, by encouraging multiculturalism and racial mixing (métissage), they stifle the self-determination of peoples along ethnic lines. As Le Pen senior, relying on the “clash of civilizations” paradigm, never tired of pointing out, “multicultural societies are multi-conflictual societies.” Thus in the National Front’s political lexicon, “multiculturalism” has become a euphemism for “miscegenation,” and the “right to difference” a coded expression for the non-acceptance of and refusal to tolerate North African immigrants and other minorities. The National Front contends that, although representatives of the democratic status quo purport to defend basic rights such as freedom of speech and freedom of assembly, such claims are hypocritical, insofar as the National Front and its followers are forbidden from employing these freedoms for their desired political ends: the promulgation of legislation that would penalize and vilify vulnerable immigrants. In her speeches, Marine Le Pen frequently seeks to turn the tables on mainstream defenders of civic and political equality. She portrays the National Front and its followers as victims and martyrs, alleging that the political establishment unfairly champions the civil liberties of immigrants, while suppressing those of Frontists. (The party name itself is reminiscent of anti-republican groups that, during the 1930s, actively—and, at times, violently—contested the Third Republic’s legitimacy.) In a parallel vein, Le Pen contends that, whereas the National Front seeks to represent the interest of common men and women—the denizens of la France profonde, who Le Pen and her allies allege are the forgotten victims of globalization—at nearly every turn, self-interested bureaucrats in Brussels, the seat of the European Commission, seek to frustrate their efforts. Recourse to a language of “plots” and “conspiracies”—purported “enemies of the people” who are threatening the nation from all sides—is a recurrent leitmotif in the rhetorical arsenal of fascist demagogues. However, inevitably, when the false promises are unmasked and the dust clears, the nation in question finds itself immeasurably worse off than before. Thus it is true of almost all far-right movements that, when in opposition, they excel at political carping and faultfinding, thereby fomenting an atmosphere of acute fear and mistrust. Yet, when it is their turn to govern, their legacy is one of political debacle and scandal. When all is said and done, the National Front’s pseudo-libertarian appeals to political pluralism and the right to ethnic self-determination are little more than a swindle. They conceal a desire to return to the program of “integral nationalism” that, during the early decades of the 20th century, was pioneered by anti-Dreyfusards such as Maurice Barrès and Charles Maurras. Both Barrès and Maurras held the egalitarian ideals of French Republicanism in contempt and sought to supplant them with the values of an ethnically homogeneous, authoritarian society. “I enter into revolt against laws that are not the laws of my race,” declared Barrès in Scènes et doctrines du nationalisme. “Nationalism means resolving all questions on the basis of French interests.” In opposition to the Dreyfusards, Barrès asserted that universal claims to justice or truth were chimerical. Instead, there were only a series of differential national truths. Both then and now, integral nationalism’s objective has been to replace the values of civic nationalism—the “ideas of 1789”—with the chauvinistic and prejudice-laden conception of ethnic nationalism. The ultimate goal is to redefine citizenship in accordance with the precepts of ethnic belonging (jus sanguinis), as opposed to equality before the law (jus soli). In her New York Times op-ed, Marine Le Pen betrayed her indebtedness to the political lineage of integral nationalism by alleging that only the existence of a “homogeneous European people” could provide a legitimate basis for the European Union. In the very next breath, she gainsaid the idea that “a Polish member of the European Parliament has the legitimacy to make law for the Spanish.” But why shouldn’t this be the case insofar as Poles and Spaniards belong to a common, supranational legal and political order, viz., the EU? What Le Pen is proposing is that the right to legislate does not derive from one’s legal status but, instead, is a function of ethnicity. Thus according to the strictures and stipulations of “Le Pen family values”—which, in a worrisome trend, are increasingly gaining currency throughout the continent—only ethnic Poles have the right to legislate in Poland, ethnic Spaniards in Spain, Français de souche or “ethnic French” in France, and so forth. One can only begin to imagine the political chaos that would ensue from the attempt to enact the National Front’s program of “differentialist racism” on a European scale. Moreover, generally speaking, claims to ethnic or national homogeneity are a political ruse or fiction contrived by political charlatans in order to further their own, persecutory ideological ends. Once one ignites the political fuse of ethnopopulism, thereby placing various ethnic and national groups in competition with one another, there is no logical stopping point. France alone is comprised of Bretons, Normans, Alsatians, Basques, and Corsicans. How might one decide among these various groups which is genuinely “French,” or which among them should be entitled to secede in accordance with the “right to national self-determination” that is disingenuously vaunted by the Le Pens? After all, the contemporary inhabitants of these regions are the product of centuries of migrations and cross-cultural contact. On this basis alone, it is indisputable that, when questions of political right or legitimacy arise, to invoke ethnicity as a criterion is a phantasm—an ideological contrivance that political elites employ to incite a frenzy of xenophobia among their credulous supporters. During the 1930s, the program of integral nationalism came to fruition in the massive street protests orchestrated by far-right parties against so-called métis (non-white immigrants). It culminated in the proto-fascist, anti-republican rallying cry, “Better Hitler than [Popular Front leader] Léon Blum,” who was both a Socialist and a Jew. Under Marshal Pétain’s collaborationist Vichy government—a regime that Le Pen senior openly views with nostalgia—immigrants were stripped of their civil and political rights, and new laws were passed privileging Français de souche or ethnic French. In fall 1940, French Jews—many of whom had resided in France for centuries—were de-emancipated: deprived of civil and political liberties and proscribed from a variety of influential professions (law, journalism, publishing, etc.). In retrospect, these measures were a statutory prelude to the Vichy authorities’ deportation of some 75,000 Jews to Nazi death camps. In contemporary Europe, the National Front’s attempt to reintroduce ethnicity as the defining criterion of politics—“Les Français d’Abord!” (“Those who are French come first!”) is a popular National Front slogan—is hardly unique. Its approach is shared by the vast majority of Europe’s far-right, authoritarian populist parties. Thus, in a disturbing trend, European nations that had previously been more or less free of far-right political influence have recently succumbed. In the German regional elections last March, the far-right Alternative for Germany (AfD) party made significant inroads and is currently represented in eight of the 16 state legislatures. In the eastern state of Saxony-Anhalt, the AfD’s share of the electorate rose to an alarming 24 percent. Apparently, AfD leader Frauke Petry’s recent suggestion that, in the future, German border guards should use firearms to keep out unwanted asylum-seekers and prospective immigrants failed to deter voters, despite the fact that, in the eyes of many Germans, it touched a raw nerve in Germany’s political history. In many respects, the situation in Germany is a microcosm of a more general political trend. Across the continent, the mainstream center-left and center-right parties find themselves in the throes of a profound crisis. Voters have increasingly lost confidence in their pledges to remedy the precipitous rise in socioeconomic inequality that ensued in the wake of the 2008 financial crisis. Nor did the European Union’s arrogant and heartless mishandling of last year’s Greek debt crisis enhance voter confidence in its efficacy and sincerity. Currently, with youth unemployment hovering around 50 percent mark in some of Europe’s southern tier (notably Greece and Spain), the millennial generation’s dreams of prosperity have been dashed. And thus, radical political alternatives are being sought, regardless of the costs or risks. In Greece and Spain, this mood has benefited left-wing parties like Syriza and Podemos. In Northern Europe, conversely, it has enhanced the standing of a panoply of far-right parties that have openly encouraged a return to the integral nationalist agenda of the 1930s: the misleadingly named “Freedom Parties” in Austria and the Netherlands; and in Scandinavia, the Danish People’s Party and the Sweden Democrats. Jean-Marie Le Pen once offered a memorable illustration of the differentialist racism credo when he avowed, “I love North Africans, but their place is in the Maghreb, not in Metropolitan France.” On another occasion, Le Pen sketched his infamous “concentric circle” approach to politics: “I like my daughters better than my cousins, my cousins better than my neighbors, my neighbors better than strangers, and strangers better than foes.” In other words: not equality before the law, but blood and ethnicity are the defining criteria of politics. As things now stand, France is home to some 4-to-5 million Muslim immigrants. One can only begin to imagine the types of discriminatory legislation—not to mention the scale of the deportations—that would likely ensue should the National Front accede to power. During the 1990s, Interior Minister Charles Pasqua, then a member of Prime Minister Jacques Chirac’s cabinet, sadistically fantasized about “charter flights for immigrants, from which one does not return.” The Pasqua episode illustrates the capacity of far-right parties to determine the national political agenda even prior to their accession to political power.